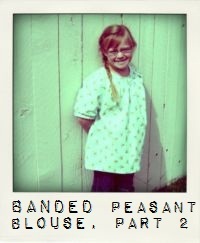 Pickup Some Creativity: Banded Peasant Blouse Tutorial, Part One. Banded Peasant Blouse Tutorial, Part One. Well, this became a bit bigger than I planned on, so I'm breaking it into two parts! I hope you'll find it helpful. To begin, go HERE to download your pattern guide. I relied heavily on indietute's peasant blouse as a base for this pattern. Please be sure to visit Charity's blog. She has some wonderful ideas. your sewing stuff, including scissors, pins, sewing machine, washable marking pen, iron, etc. Step two. Create your pattern pieces and cut out your fabric. Print your pattern guide (HERE). 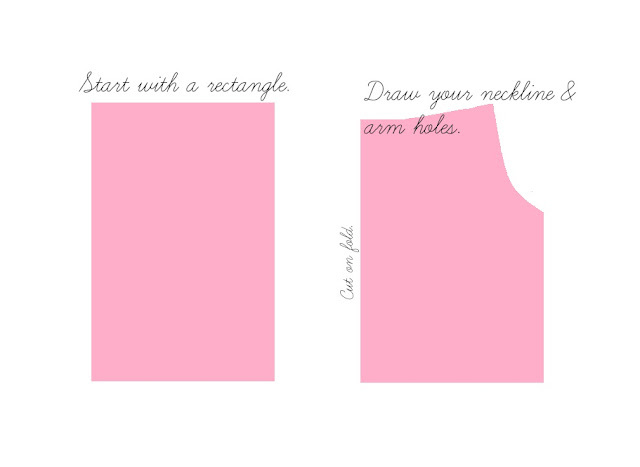 The blouse bodice is a rectangle (you'll be cutting on the fold), which you then shape following my guide. Using the pattern pieces, cut out your front and back neckbands, arm bands. You'll cut a 1" by 5" piece of fabric to line back neck slit. Wow! Ok, now for the fun part! Step three. Interface one front neckband, back neckbands and both armbands. Take that lining you cut, (1" by 5" piece), and pin it to your slit opening. 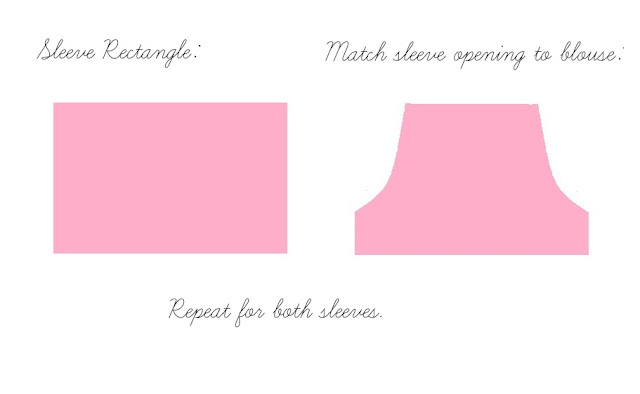 Sew the two pieces together. This is the trickiest part! You want to get as close to that point as you can. Now open up the neckline, and press the other side of the lining in 1/4". Fold over the lining so that it covers the seam. Sew over the lining piece. Press so that it lies closed. Finally, fold over and sew a little square to hold it all together. Step five. Make your button loops. I use the same method I did for my Grown-Up Peasant Blouse and Portfolio Dress. BIG NOTE: Be sure you put the neckloops so that they close the same direction that you sewed the neck slit closed. I goofed this the first time! Craft Gossip! and Be Different Act Normal! you're amazing. Some day you'll have to share with us the secret for getting so much sewing and blogging time. Please! awesome Chris, can't wait to see the rest! Agreed! She is SO you, oh my goodness! Great tute Chris, thanks. I have the perfect material to make this for my daughter. Thank you for sharing. This is great! I love this top!!! The loose fit and a cotton woven are perfect for summer! What an adorable model!! Your steps are so clear and easily understandable - thank you! so sweet, and an amazing tutorial! thanks so much for sharing on Craft Schooling Sunday, great to see you!